The Teleswitch Remote Wireless Switch Control by Ritron can control nearly any device which is operated by a switch. With the simple installation of a pair of relays, the Teleswitch can operate the switch from a remote location up to 2 miles away. The TeleSwitch has tw independently controlled relays, each providing a contact closure output upon receiving a uniquely defined DTMF (touch tone) code. This innovative two way radio product consists of a RF trasceiver and programmable DTMF decoder housed in a durable, weather-tight enclosure. The newly designed TeleSwitch combines rock-solid engineering with advanced solid state technology for reliability and ease-of-use. Applications for the economically priced TeleSwitch are endless. Use for Electric/ Gas Utilities, Petroleum, Chemical, Water/ Waste Treatment Plants, Environmental Monitoring, Food/ Agriculture Operations, as well as general manufacturing and industrial processes. The TeleSwitch offers a great price-to-performance ratio that improves resource utilization. 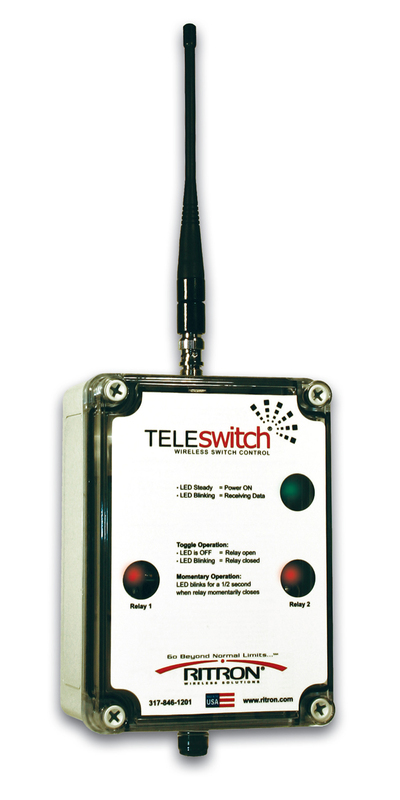 If you need long-range switch control, the TeleSwitch may be ideal for your operation. Other accessories available, including an optional "multi-code" relay control board which allows separate DTMF codes to be used to open and close the relay, spare cube power supply, spare flexible antenna, and optional remote mount magnetic mount antenna with 25 feet of cable. For remote applications where electricity may not be available, use the Ritron RS-100 Solar Kit, sold separately. Available in UHF and VHF models.